A stroll through Ireland’s mystical past, from ancient castles and rugged stone monuments to lively taverns and modern day crafts. I recently paid a visit to Ireland’s Ancient East. What’s that, you say? You haven’t heard of such a place? Well, I was once the same as you. In fact, I was skeptical about the very idea of it. But now I’m a convert and I’m writing this article to tell you why. Back in 2014, Ireland’s “Wild Atlantic Way” was opened and it’s since attracted thousands of foreign and domestic tourists, all keen to experience the twists and turns of this coastal driving route. Eager to attract more tourists of their own, the people of the southeast decided to launch their own tourism initiative, calling it Ireland’s Ancient East. 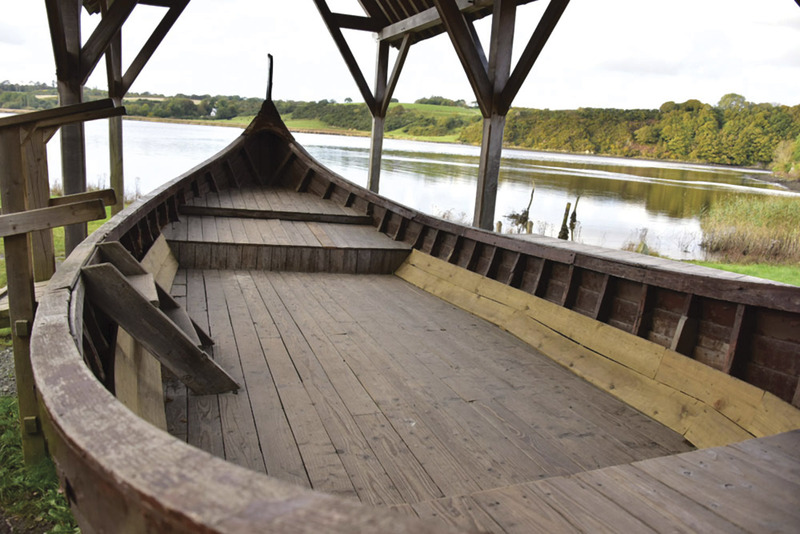 A Viking longboat in Wexford’s Irish National Heritage Park. My mind was changed by a recent whistle-stop tour of Kilkenny and Wexford. I started my travels in Kilkenny, where I stayed in the Pembroke Hotel, right in the heart of the city. This hotel used to be a garage run by a man who was passionate about cars. The management decided to pay tribute to his passion by retaining one of his old cars – a Ford Racer which is displayed in the courtyard – and by holding regular classic car conventions in the hotel. There was a Bentley convention on while we were there, which made my car-obsessed partner delirious with excitement. The staff of the hotel are wonderfully welcoming, even going so far as to bring us up to the hotel rooftop to point out the different places of historical interest in the city. Be sure to take advantage of this service if you stay here. Our first evening in Kilkenny was spent enjoying dinner in the hotel bar and then strolling through the town. We walked down the hill past the castle and then took a left up High Street. We heard the sounds of chatter and laughter coming down a little alleyway and followed it until we found ourselves in a tiny pub. The historic bridge leading to the village of Inistioge on the River Nore. Appropriately called the Hole in the Wall, this Elizabethan tavern dates from 1582 and it’s retained its original features, including lots of oak beams, one of which serves as a bar. The entire pub measures 20 feet by 20 feet at most and that evening there were two local brothers playing the accordion and singing, a young forester from Wexford, and a family from Vancouver sitting at the bar. Once my partner and I were added to the mix, the place was full. We eventually tore ourselves away from the revelry because we knew we needed our energy for the following day. That day started with a trip to Kilkenny Castle, which dominates the city from its riverside setting. There has been a castle there since Strongbow built one in the 1100s. His was a wooden construction and the current stone-built castle was completed by one of his heirs in 1213. That castle was square-shaped with towers at each corner, three of which survive to this day. 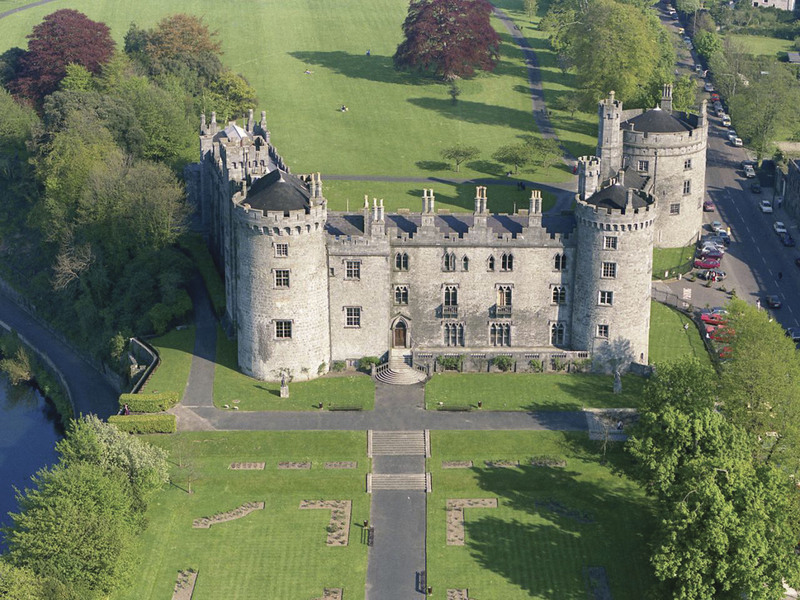 The fourth, along with one whole side of the castle, was demolished by Oliver Cromwell during his siege of Kilkenny in 1650. We started our visit by watching a multimedia presentation in one of the castle towers. This gave an outline of the castle’s history, beginning in medieval times and continuing up to the Irish Civil War when Republican forces sheltered there. It also told of how the castle passed into the hands of the Irish State in 1967 and of the painstaking restoration works that have been carried out since then. These details deepened our insights as we walked through the castle afterwards. Kilkenny Castle, which was built in 1195 to control a fording-point of the River Nore and the junction of several routeways. Just outside the entrance to the castle is the Kilkenny Design Centre and National Craft Gallery. This part of Ireland is renowned for its crafts and we were soon wishing we had space in our suitcases and money in our bank account to bring some back home with us. 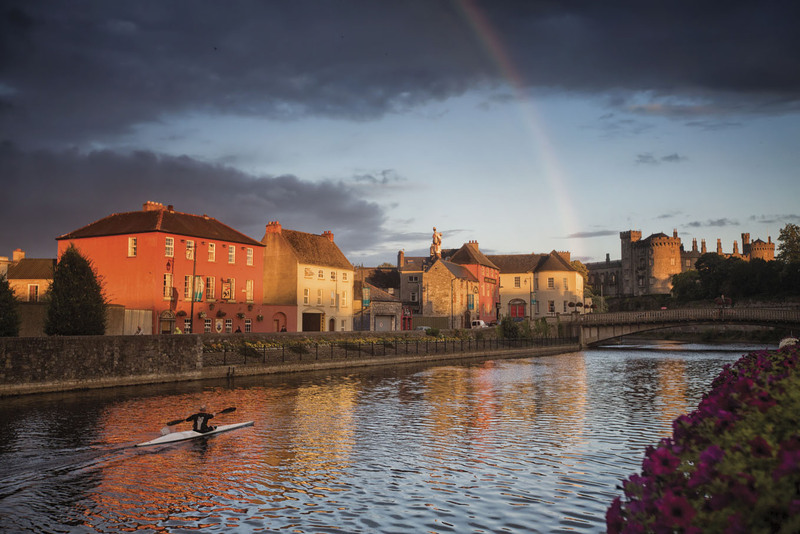 Instead, we dragged ourselves away and continued along Kilkenny’s Medieval Mile, a route which begins at the castle and takes in most of the must-see sights of the city. Rothe House was next on the agenda. Built in the late 1500s, this house is still much the same as it was when then-Mayor of Kilkenny John Rothe Fitz Piers lived here with his wife and twelve children. The rooms have oak-beamed ceilings, open hearths and leaded windows. There are several internal courtyard areas and lots of treasures to discover as you wander through the building. These include the antlers of a giant Irish deer, a species that’s been extinct for 10,000 years. There are paintings by John Lavery, including a portrait of his wife who famously appeared on Irish banknotes in the 20th century. And there is also a collection of 18th and 19th century costumes, including wedding dresses, parasols and hats. 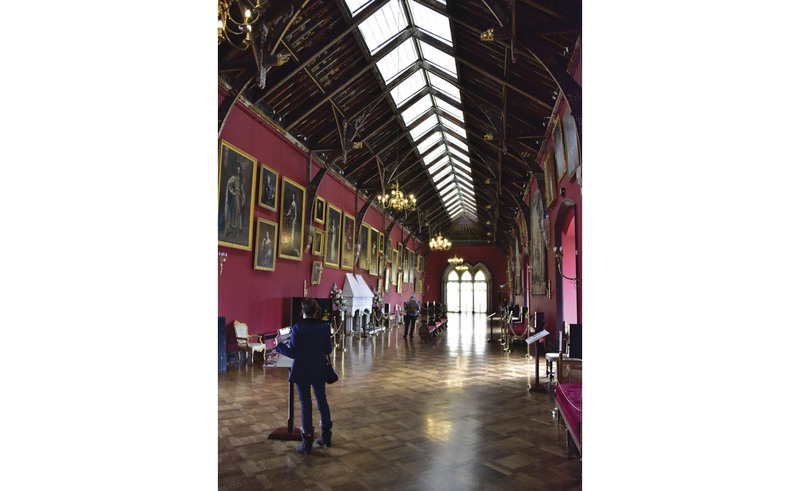 The portrait hall at Kilkenny Castle, some of which dates to the 16th century. By the time we’d finished, we were hungry for lunch and made our way to Kyteler’s Inn, which boasts its own fascinating history. A woman called Alice Kyteler opened it in 1263. Alice went on to become known as something of a merry widow, marrying and losing four husbands in her lifetime and amassing a large fortune along the way. Unfortunately, she also amassed enemies who conspired to accuse her of witchcraft. 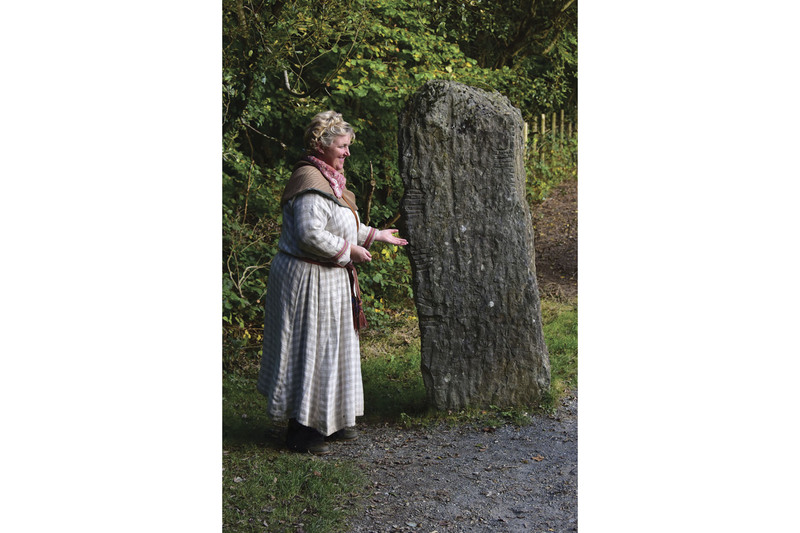 Their accusations led to Ireland’s only witch trial taking place in Kilkenny in 1324. Alice was found guilty but was able to escape to England before her execution could take place. Her lady’s maid was not so lucky. She was paraded through the streets of the town, beaten and burned. We travelled further back in time at our next destination. 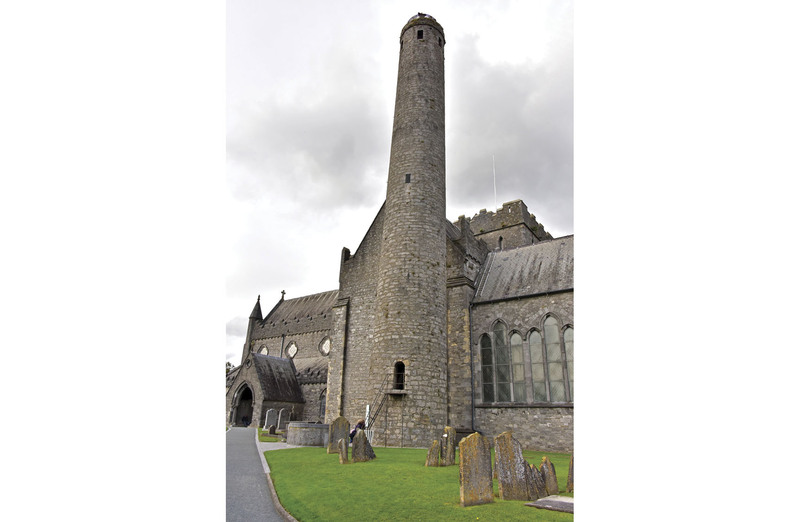 Saint Canice’s Cathedral is one of the showpieces of Kilkenny City. A church has stood here for the past 800 years and the one that stands today is certainly impressive, with its renowned stained glass windows and tombs encasing members of Kilkenny’s noble elite. However, what I most enjoyed about the cathedral was the round tower outside. It’s one of only two round towers that you can climb in Ireland and as I made my way up its rickety ladders, I couldn’t help but imagine myself as a medieval monk fleeing from marauding Vikings. Being in that dark tower made me feel a truly tangible link with history. Our journey along Kilkenny’s Medieval Mile ended in Smithwick’s Brewery. Not being a big beer drinker, I was surprised to find myself enjoying our tour of this brewery as much as I did. Our guide was so enthusiastic, telling us how the history of beer brewing on the site began with monks and was then taken over by the Smithwick’s family. He explained the process of beer brewing too, demonstrating how water, yeast, barley, and hops were mixed to produce the ruby-red ale that is drunk all over the world today. He brought each chapter of Smithwick’s long history to vivid life and I couldn’t wait to sample the different beers at the end. 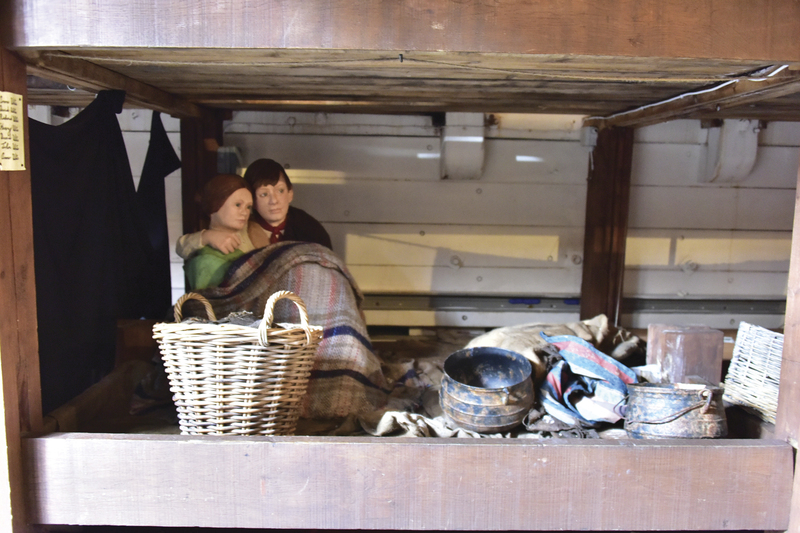 A typical “family” bunk on the Dunbrody, a replica of a Famine-era sailing ship that bought thousands to the New World. Those beers were to be our pre-dinner drinks as we had booked an early dinner in the nearby Foodworks Kilkenny. This restaurant blends the old and new by taking the very best in Irish ingredients and cooking them in an innovative and modern way. We’re still raving about the braised beef with chard, carrot purée, and beef gravy. The next day saw us leave Kilkenny for Wexford. There, we visited Bennettsbridge, with its picturesque bridge over the River Nore and its amazing craft shops. Within the space of an hour, we saw candle makers, potters, and wood turners at work. Next was Jerpoint Abbey, which was built in 1180 and is now in ruins. But oh, what ruins! We were entranced by its ancient stone crosses, sculptured cloisters, and beautiful carvings. 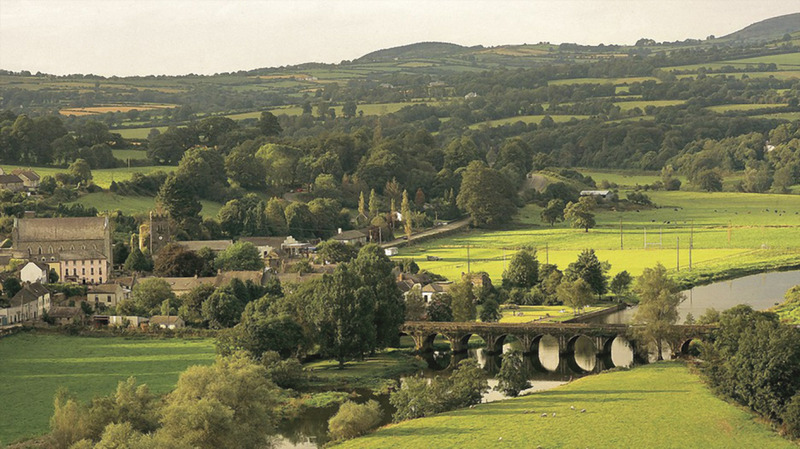 We couldn’t resist stopping off at Inistioge, the picture-perfect village that was the setting for the film version of Maeve Binchy’s Circle of Friends. Its riverside setting and woodland surroundings made it the perfect place for a walk. Ogham stones being explained at the national heritage park. Finally, we ended up at the Dunbrody Famine ship in New Ross. This is a reconstruction of the so-called coffin ships that crossed the Atlantic during the darkest years in Irish history, bringing starving men, women and children to a new life in the Americas. We were guided through the ship’s cramped quarters and introduced to two actresses who played women from the era. Once was a shopkeeper’s wife who was scathing about the filth and squalor of those travelling in the bowels of the ship. The other was the mother of five children whose husband was dying of a fever he’d contracted on board. You could almost smell her desperation. One of those who left Ireland during the Famine years was Patrick Kennedy, whose homestead we visited later that afternoon. It’s now famous because it was the place to which his great-grandson, John F. Kennedy, returned when he visited Ireland in 1963. View of the River Nore with the backdrop of Kilkenny Castle in the medieval city of Kilkenny. There’s now an interpretive center there which tells the story of how the Kennedy family progressed from fleeing the Famine to reaching the pinnacle of U.S. politics within the space of a few generations. It’s well worth a visit, particularly if you get a chance to meet the latest Patrick Kennedy, a distant cousin who is utterly obsessed with his links to JFK. There’s more to see in Wexford, too. We visited Hook Lighthouse, one of the oldest lighthouses in the world. It was built 800 years ago by monks who wanted to warn seafarers of the dangers of Wexford’s rocky shore. It’s an evocative building with its thick stone walls and worn stone steps. It’s a beautiful place that offers a changing view of the Atlantic waves pounding the shoreline with each of the 115 steps to the top. The Irish National Heritage Park was supposed to be the last destination on our tour of Ireland’s Ancient East, and it proved to be just as intriguing as those that had gone before. 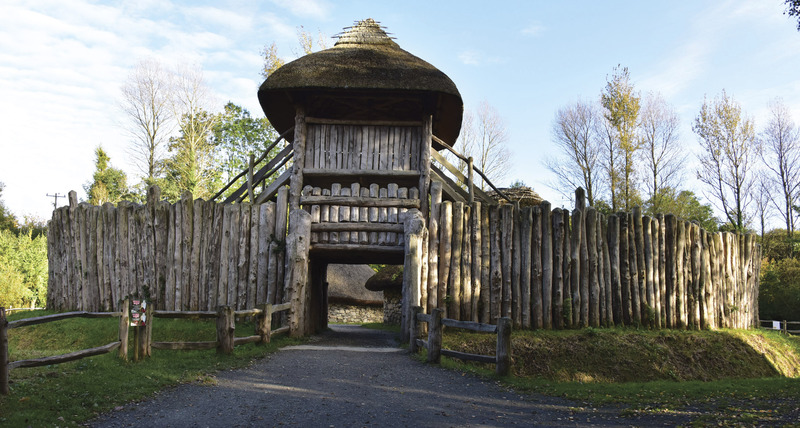 Set in natural forestry, it’s an outdoor museum that allows visitors to explore 9,000 years of Irish history. St. Canice’s Cathedral, Kilkenny, dates to the 13th century and boasts a 121-step, 9th century round tower with panoramic city views. 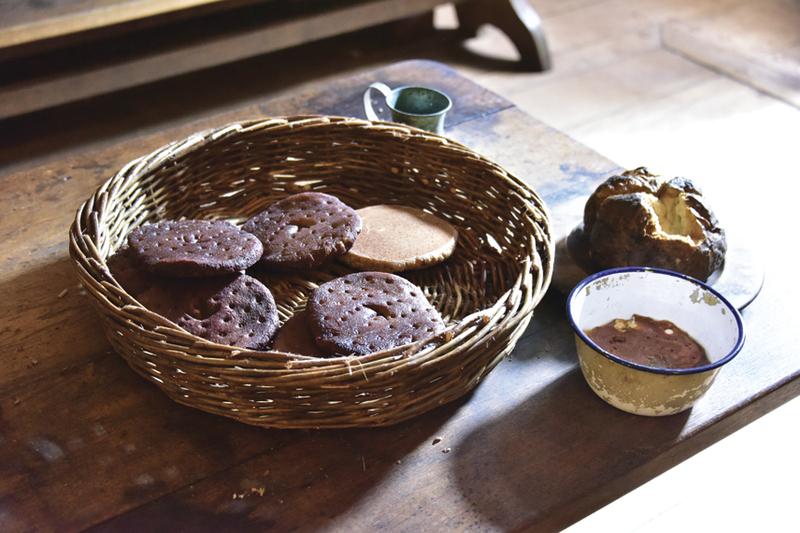 What this meant was that we got to wander through reconstructed Stone Age buildings, to cross a lake to a crannog, to sit in a Viking household, and even to see how food was cooked in a fulacht fiadh – a pool of water that was heated by stones from a fire and then used to cook meat. I was most fascinated by the Iron Age ringfort. It’s available for overnight stays and I’m already daydreaming of returning to spend the night in one of its stone cottages, wearing period costume and cooking over the central hearth. Fuel, beer and mead are provided for these stays and visitors can book archery lessons or rudimentary bush craft lessons in the park. What an experience that would be! We were reluctant to return to the modern world too quickly after our trip to Ireland’s Ancient East. That was why we decided to stop off at Dunbrody House on our way home. A replica of a 1,500-year-old Irish ringfort, where you can stay overnight and live as your long-ago ancestors did, situated in Wexford’s Irish National Heritage Park. Situated on the Hook Peninsula, this Georgian country house is run by Kevin Dundon and his wife, Catherine. Kevin is one of the best-known chefs in Ireland and he and his wife have created a wonderfully relaxing place to be, a place that embodies the luxury of the past where guests enjoy food that is a treat for all the senses.